Sunday, December 2, 2018 marked the beginning of the Nativity Fast-Advent season. 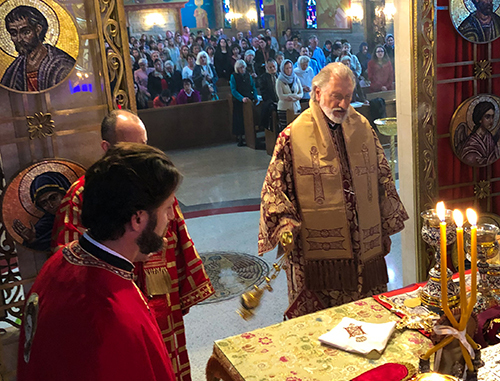 Our Cathedral was blessed with the presence of His Grace Irinej, Bishop of the Eastern American Diocese, who joyously celebrated the Divine Liturgy, and concelebrated by Cathedral Dean Fr. Darko Spasojevic, Fr. Dobrivoje Milunovic and Deacon Theodore Sokolovic, with the participation of our former Cathedral dean, Fr. Uros Ocokoljich and Father Nikolaj Kostur. The choral responses by the S.S.S. Branko Radichevich were beautiful, leading our faithful to “lay aside all earthly cares”. The epistle was read by Krstana Milunovic of the HRSOC Teens Youth Group, reciting the message from Ephesians “Finally, my brethren, be strong in the Lord and in the power of his might….”. Bishop Irinej’s enlightening sermon centered on the Gospel narrative, emphasizing Christ’s love for his flock as demonstrated in the miraculous healing of a woman inflicted with infirmity for eighteen years. Many faithful partook in the holy sacrament of Communion, and it was truly divine to see our Cathedral filled with so many children, their parents and faithful parishioners participating in the liturgical celebration. 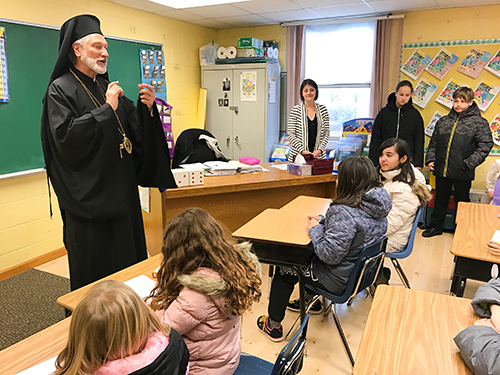 Bishop Irinej’s love of children was evinced by his visit earlier in the morning to the Church School children. Many of our parishioners will remember that prior to his elevation to the diaconate and the bishopric, he spent several years at our parish, serving as the Director of Christian Education. His Grace enraptured the children with his discussion about the meaning and the importance of the celebration of their Krsna Slava, which was the topic of the class discussion. Following the Divine Liturgy, parishioners gathered in the banquet hall for a luncheon that was sponsored and underwritten by the Cathedral Circle of Serbian Sisters, to provide financial support for the neediest children, and their parents, in Kosovo and Metohija. They selflessly gave their time, talent and treasure to successfully execute this important fundraiser, and also prepared a delicious Lenten meal to approximately 200 guests. Kolo President Mira Djordjevic opened the program by welcoming everyone and thanking them for attending and for their support of this important endeavor. The highlight of the event was a video presentation by His Holiness Patriarch Irinej, who spoke of the dire current conditions in KiM, and stressed the need for humanitarian relief for our Serbian children living in the region. The Kolo is indebted to the official television of the Patriarchate, TV Hram, and its director, the Very Rev. Stojadin Pavlovic, for producing His Holiness’ message to share with our audience, as well as Protodeacon Dr. Damjan S. Bozic for serving as an intermediary. The Sisters also express their gratitude to Bishop Irinej for his keynote speech, as he spoke of the present circumstances in KiM. He expressed his profound thanks to our Kolo and Cathedral for the support they have shown to give these children a brighter future. The Kolo must also extend their deepest appreciation to Professor and photographer Olivera Radic of Orahovac, Kosovo, for so generously submitting hundreds of photographs that directly convey the poverty of existence—and hope—of the residents who strive to be able to continue to live in their ancestral homeland, despite the barriers and sanctions under which they are forced to endure. And most importantly, the Kolo gives its profound thanks to each and every one who so generously contributed, and make possible a healthier, more respectable and safer life for the children in Kosovo i Metohija who most desperately need it. May God bless all of you. If you have not and would like to contribute, the Cathedral Kolo will be accepting donations until the end of this month. Please make your check payable to the Circle of Serbian Sisters, earmark “Kosovo Children” and mail to 5701 North Redwood Drive, Chicago, Illinois 60631. Thank you.